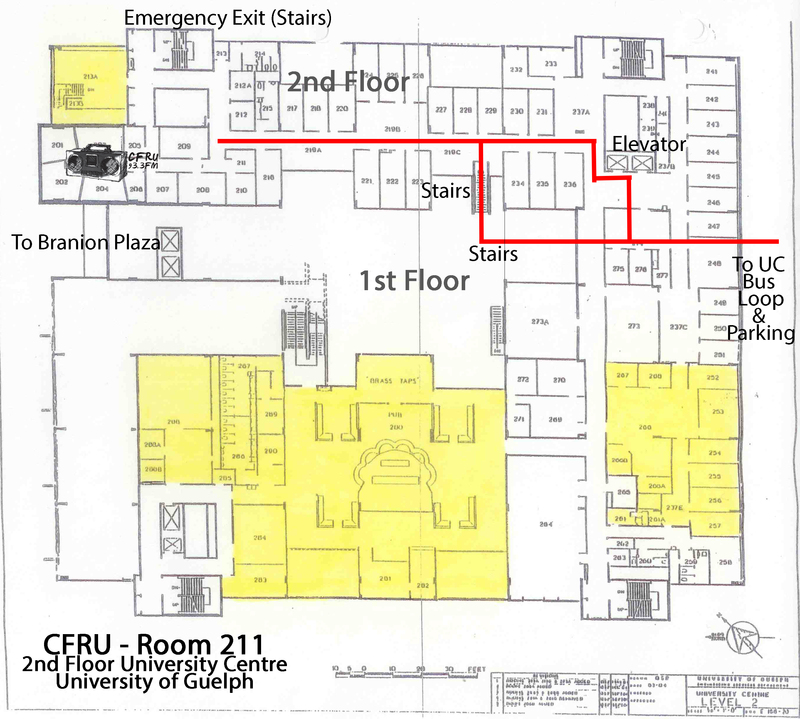 CFRU is located on the 2nd floor (Room 200-211) of the Unversity Centre at the Univeristy of Guelph, in Guelph Ontario Canada. Accessibility: CFRU is partially accessible. From Toronto, take Highway 401 West to Highway 6 North (the Hanlon Expressway). Drive North on Highway 6 until Stone Road. Turn right on Stone Road, and drive until you reach Gordon Street. From London (Cambridge), take Highway 401 East (heading towards Toronto) to Highway 6 North (the Hanlon Expressway). Drive North on Highway 6 until Stone Road. Turn right on Stone Road, and drive until you reach Gordon Street. From Kitchener/Waterloo, Take Highway 7 East (Victoria Road) to Hightway 6 North (the Hanlon Expressway) Drive South on Highway 6 until Stone Road. Turn left on Stone Road, and drive until you reach Gordon Street. From Hamilton, take Highway 6 North past the Highway 401 overpass to County Rd. 46. Head north on County 46 (Gordon Street) to Stone Road. Once you reach the intersection of Stone and Gordon, drive North on Gordon and turn right immediately onto South Ring Road. Attendant parking is available on the right. 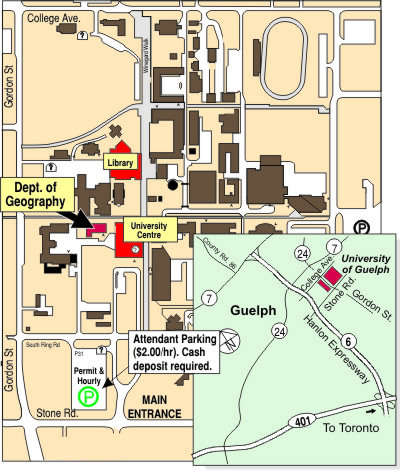 The University of Guelph’s parking fee is $2.00 per hour with a required deposit of up to $16. You may also park at one of the university’s metered lots at $2.00 per hour, payable by change or telephone credit. Most metered parking lots have a five-hour limit; there is also one lot with a one-hour limit. All campus parking is free on weekends and after 5 pm on weekdays. Unfortunately, free parking before 5 pm on weekdays is very difficult to find around the university. Free curbside parking may be found on Rickson Avenue (all day) or the University Avenue area (for two hours maximum). The walking time to the station is between 10-15 minutes from both locations. Go Transit – The university is services by a hand-full of routes directly to the University of Guelph Bus Loop. Please see the schedule here: http://www.gotransit.com/publicroot/en/travelling/stations.aspx?station=GUNI Alternativly, Go transit also services via Train and downtown services (As well as Abryfoyle station, though this is a ways out of town). City Transit from downtown is available. Walking distance downtown is approximately 45 minutes. Greyhound Transit – Greyhound services The University of Guelph Bus Loop, Please see the information or from its Downtown Guelph location information. City Transit from downtown is available. Walking distance downtown is approximately 45 minutes.